Everyone's been waiting for the heists—the signature criminal activities from Grand Theft Auto V's story mode—to come to the game's online component. Rockstar says they're coming this spring. The High Life Update: The High Life Update will allow you to expand your foothold in Los Santos with new high-end apartment options, the powerful Bullpup Rifle, new wardrobe items, the Dinka Thrust motorcycle and three new lavish cars to choose from, including the Super class Pegassi Zentorno. The High Life Update will also feature the debut of multi-property ownership in GTA Online, which means you'll be able to own two distinct properties (with garages) simultaneously. All this plus the new Mental State player statistic, which is designed to let you see just how passive or psychotically unhinged fellow players in your session really are, and a slew of new Jobs. 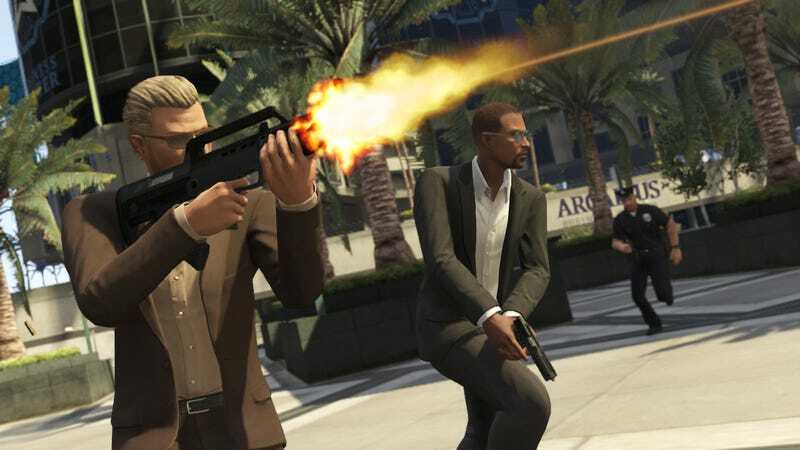 Players have been waiting for the Heists feature ever since the rocky launch of Grand Theft Auto Online last fall. While the service has stabilized, stamped out cheating exploits, and curated user-created missions for the general public to play, Heists—with their promise of an online interpretation of the in-house Rockstar set-piece sensibility—still stand as the kind of feature that could make GTAO stand out from other games' multiplayer offerings. Rockstar's post also mentions that they'll have news on Story Mode DLC in the future. We'll share more info on the availability of Heists as we get it.